The best hiking gifts for kids are the ones that feed their curiosity about the outdoors, build their endurance for longer hikes, bring happy smiles, and lead to great family memories of shared trail time. If you hike with babies and children, you'll notice their interest in hiking gear and great trail destinations increase with each passing season. And that means you'll need some clever hiking gift suggestions for kids. Hiking with kids will develop an entirely new skill set for you, especially if you keep your eyes open for what really stokes their excitement about hiking. One of my children was fascinated with pine cones and pebbles, animal tracks, and finding feathers on the trail. My other kid? Totally into trail snacks!! She never lost her interest in food, and is a truthful critic of trail food today. I'm sure you can think of what intrigues your kids, too. Take mental notes along the trail, and translate those interests into great hiking gifts. Beyond the obvious hiking gear list that kids need to be safe and comfortable on the trail, let me offer a few suggestions for hiking gifts that I know from experience were well received by hiking kids. Have you seen these glow sticks? The kind you wear around your wrist are especially cool. They won't last forever once they are activated (8 hours is typical), but they can make a night hike into a very cool experience. Or falling asleep inside a tent...instant night light! And you can link them together and make all sorts of interesting stuff to keep a young hiker occupied. As long as you explain that it's only for using once in a while, any kid will like clipping a whistle to a pack or belt loop. Don't bother with the cheap plastic ones, because they break after only a few minutes. Let your little hiker practice 3 long blasts (universal distress signal) at least once during a hike! You'll be famous as the person who picks out the best gifts for hikers in the family (especially if you wrap it up with a sack of trail snacks, like these). Be sure to get a real carabiner, too - just like the grown up hikers! Attach the whistle to a belt loop or pack, and watch it stand up to all sorts of torture from young hikers. This gift can lead directly into discussions about how to stay safe, and found, if separated from you on the trail. And for good reason: Cherished memories of hiking and camping trips. Remind your favorite young hiker of a treasured hiking destination or favorite hike by gifting her/him with a beautiful wooden hiking stick. And then add a medallion! One of the best gifts for hikers you can dream up! For lots of selections from a great company, try these medallions. Or pick a zipper pull that doubles as a compass. You can teach navigation skills without really trying! As a bookworm from way back, I just had to throw that in there as a possibility for best gifts for hikers of a young age. I was one of those kids drawn to books like a magnet. I could never get enough of illustrated guides to birds, flowers, trees, rocks, mammals, stars... and my current bookshelves are testament to that early thirst for books. Do you know a kid like that? Depending on the child's personality and reading skills, you can pick out a few nature guides to nourish the budding interest in nature. For ideas on some of the best books, here's a master list of outdoor books for kids for you to use. Some of these editions might become permanent additions to their personal library, just as the Euell Gibbons books on my shelf are treasured classics. Some families have a rule about gear and outdoor clothing for the kids: They are used only on the trail. You can also get kids T shirts in lots of color choices with the Hiking For Her logo. Men and women's sizes, too! A well designed hiking hat can make trail time special, too. She never needs to know you're protecting her face and eyes from UV damage! Check out these water bottles, because you can customize the top, middle and bottom colors. Think about your child's favorite sports team or superhero! They come in small sizes with a nice surface feel for small hands. They slide easily into and out of backpacks. You can buy one for each of the hiking kids in your life, knowing they can be used for other purposes (camping, school, sports practice) and will last a long time because they're stainless steel. Nice gifts for adults as well. Not sure how to pick out a backpack for your kids? Here are some tips for selecting the best girls hiking backpacks. And for the best boys backpacks for hiking. 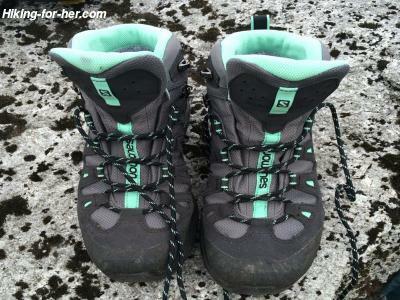 If you'd like some tips on selecting good boots, my advice for adult hiking boots works just as well for picking out kids hiking boots. In fact, any of my hiking gear tips can be applied to the child versions of hiking gear. If your child wants to give a gift to a favorite hiker in the family, here are some inexpensive hiking gift suggestions. And if you're stumped as a non-hiker what to give your favorite hikers, read this guide to gift hiking, written for those who don't hit the trail. great hiking gifts for kids? If you're a non-hiker trying to find the right hiking gifts for kids, you probably have some questions about possible candidates. Ditto if you're racking your brain for gift ideas for the grown ups in your family who hike. Send me your questions, using the CONTACT link at the top of this page. I'd be happy to give you feedback, and suggestions, so your gift is just right. Great hiking gifts for kids leads to happy hikers. Answering your question(s) is just one small way I can encourage kids to get out on the trail, and ultimately preserve the wild spaces for generations to come! At no extra cost to you, your purchases keep the Hiking For Her website humming along, bringing free, reliable hiking advice to the hikers in your life. Or you!